Dividends in Hand: Two Minute Walk to the Beach??? Two Minute Walk to the Beach??? When my wife and I go on vacations, instead of staying in a hotel, we do home exchanges or rent houses. Having access to a larger place is more practical when you have an energetic two year-old. 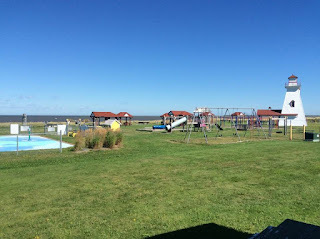 During our first week in New Brunswick, on Canada’s beautiful east coast, we rented a cottage at Parlee beach in Shediac. One of the reasons my wife chose the cottage was the “2-minute walk to the beach”. When she first mentioned this “2-minute walk to the beach”, I was skeptical. My business education and work experience have heightened my ability to detect a B.S. sales pitch. When we set off to find the beach the day we arrived, I checked my watch and noted it took us about 10 minutes of wandering to reach our destination. We found a shorter path to return, but it still took over 7 minutes. Over the course of the next few days, being highly analytical, I continued to time our journey to and from the beach. Our times ranged from a tad over 5 minutes to a high of 12 minutes. You might have noticed in the first paragraph the reference to my energetic two-year son. To say he was a contributing factor to our variable walking times would be equivalent to implying the sun might have played a role in my sun burn. With dogs, school buses, other kids and a lighthouse on the way to the beach, my son was usually distracted and never in a hurry to make it to our destination. 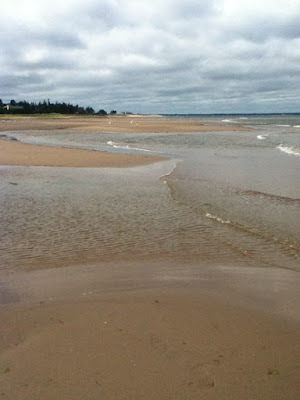 After a week of trekking to the beach with my son, I decided to go for a run on our last day in Shediac. Although I used to be a pretty competitive runner in high school and university, my runs now tend to be of the relaxed variety as I am more focused on enjoying the scenery than achieving personal bests. Of course, my relaxed running attitude didn’t stop me from starting my timer, and heading off for the beach. Despite taking the most direct path, running at a decent pace, and leaving my two-year old son behind, it still took me two minutes and thirty seconds before my bare feet hit the beach sand. While spending 40 minutes running on the wet sand on the edge of the water, I quickly forgot about my failure to make it to the beach in the advertised two minutes and instead enjoyed one of my most invigorating runs of my life. After five years of reading personal finance and investing blogs, I like to think my B.S. detector is well tuned. As I read about more bloggers achieving financial independence in short periods of time, by following one strategy or another, I'm increasing skeptical about the truth of their claims. I freely admit to making many, many mistakes along my own path, and know that at best, I'm only about half way to my destination. If there are any of you out there that need a reminder, I can assure you that there is no 2-minute walk to the beach, nor is there a safe, rapid path to financial independence. Those who claim otherwise are misleading you, lying to themselves, or simply being ignorant. Although many of us our focused on our investing metrics and the end result of being financially independent, it truly pays dividends to take a step back and enjoy the journey. As tempting as it is to take short-cuts (high yield stocks are my weakness), cut corners (slashing expenses to the bone to feed a brokerage account), or compare your progress to others (tracking your net worth compared to your favorite bloggers), as was reinforced by my recent run along the ocean, achieving financial independence is not a race, but a beautiful journey. 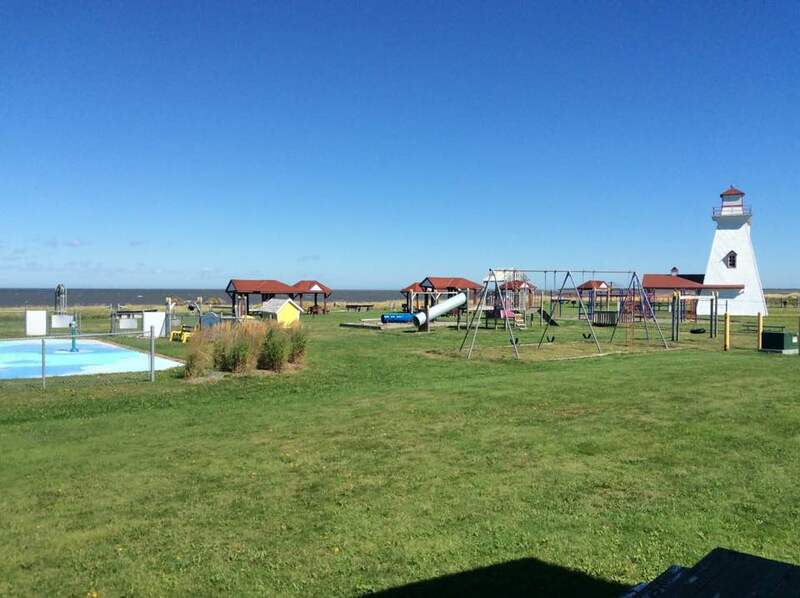 My second week of holidays in New Brunswick was spent at a lovely ocean view cottage in Caraquet. Any idea what description of the below property would have prompted my wife to pull the trigger? Needless to say that with a park on the way, my son once again proved to me that there is never a 2-minute walk to the beach! How do you achieve a balance between enjoying the process to financial independence without becoming fixated on the destination? I think I worry to much about money and it probably drives my wife crazy. On the flip side I am the only source of income for 7 people so it is a wee bit of pressure. But like you I do stop to "smell the roses". Life is to short not to enjoy it. Wow, super impressed that you support 7 people...no wonder you worry so much about money. Glad to hear you do stop and smell the roses though. Thank you so much for sharing your personal experience in order to spread this wonderful message. Sometimes we get worked up so much we forget that our main purpose in life is to be happy. And that is what we should be in the first place.